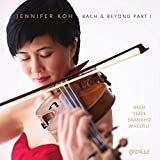 Jennifer Koh gave a commanding solo performance Wednesday night in a program that honored the enduring relevance of J. S. Bach, both as a touchstone for composers after him and as a voice that directly appeals to audiences now. Filling the Strathmore Mansion's cozy music room with an electrifying sound, Koh used two Bach partitas, pinnacles of the violin repertoire, to bookend a selection of later pieces that were in some way inspired by them. The concept, titled Bach and Beyond, has generated a series of recitals and a new recording. Unfortunately, program notes to elucidate the connections between pieces were not provided, though they should have been readily available since the concert had already been performed elsewhere. Koh opened with Bach’s Partita No. 3 in E Major. She summoned a vigorous tone for the suite’s sunny, expansive Preludio. In the intimate Loure that followed, Koh set up an elegant rhythm but could have quieted her sound more; it was loud and a bit harsh even toward the back of the small room. From the partita Koh moved without pause into Belgian virtuoso Eugène Ysaÿe’s Sonata No. 2 in A minor. This was an obvious pairing, since the sonata begins by quoting the partita’s opening phrase. But Ysaÿe soon turns away from Bach in frustration to brood over the medieval Dies Irae tune. What follows is not a particularly profound engagement with Bach but rather an undistinguished hodgepodge of overwrought late-Romantic sounds bites. Nonetheless, it served as a vehicle for Koh’s virtuosity, from the bleak strains of the second movement, played with a haunting, vibrato-free tone, to the third movement’s meaty pizzicatos. Finnish composer Kaija Saariaho’s Nocturne was the night's shortest but perhaps most intriguing work. It was a hushed exploration of the violin’s different timbres, ranging from percussive scratches to spectral harmonics. The subtle adjustments of bow position and pressure that Saariaho called for allowed Koh to reveal the richness of overtones contained within each note. Next was the fidgety, angular Fantasy by American composer Elliott Carter, who died two weeks ago, followed by Lachen verlernt (“Laughter unlearnt”) by Saariaho’s countryman Esa-Pekka Salonen (b. 1958). This anguished, cathartic work was written in Bach-inspired chaconne form, which tied it to the evening’s final piece. Koh closed with Bach’s Partita No. 2 in D Minor, crowned by its monumental last movement, an emotionally and intellectually intense chaconne that is a violinist’s Everest. Koh’s fiery technique was a perfect match for the work’s challenges, and she gave it a memorable performance.